Furr’s Millionaire Pie is a delightful light pie, light in the texture, and bright flavors of the topics. Furr’s millionaire pie is a creamy pie that is sweet and bursting with flavors of the tropics. Recipe adapted from Fort Star Telegram. So do you want a rich and creamy pie? This pie is exactly that, rich creamy, and will make you think you are a millionaire. So maybe we aren’t all millionaires, but this is a delicious pie that everyone will be asking you for the recipe. 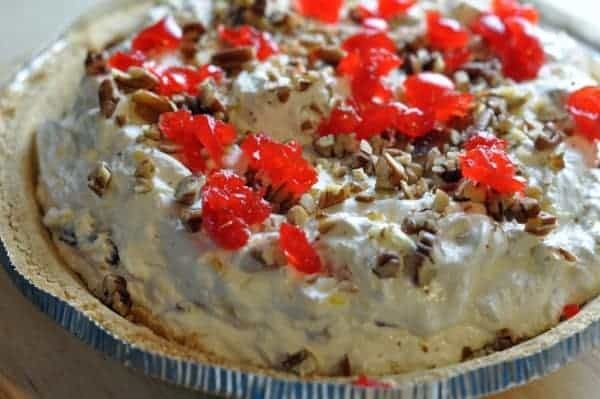 There are similar recipes out there for a millionaire pie that has whipped topping as an ingredient but don’t go that route, take a few more steps, and you will have a pie that makes you feel like you are a millionaire. Furr’s cafeteria makes many tasty dishes, don’t miss out on other copy cat recipes, that taste just like they came from the restaurant. Furr’s Cafeteria Pineapple Millionaire Pie is a rich and decadent pie. Cream 2 cups powdered sugar and butter with electric mixer. Add eggs, salt and vanilla. Beat until light and fluffy. Spread mixture evenly into baked pie crusts. Chill. Whip cream until stiff. Blend in powdered sugar. Fold in pineapple and pecans. Spread mixture on top of filling and chill thoroughly.If you concerned about using raw eggs, please use imitation eggs such as eggbeaters, or eggs that have been pasteurized, either work well. Pasteurized eggs are very safe for people who may have compromised immune systems. I would love to find the recipe for Furr’s Cafeteria Apple Dumplings. You wouldn’t know the recipe for a pie at an old Spinnaker’s. It was a cream pie with graham cracker crust. It had nuts, bananas, coconut, pineapple. I’ve forgotten the name but is love a recipe for it! They closed our Furr’s in Corpus Christi, lost their lease, which I doubt happened. They say they will re-open in two to three years. This I have to see. No one will respond to my emails about what happened. I noticed they closed the Victoria texas location. They must no like us in South Texas. Just today, I was going through my mother’s handwritten recipe cards and came across this recipe. I grew up in West TX (Lubbock) and Furr’s restaurants, cafeterias and markets (later supermarkets) filled my life on a near daily basis. This recipe is close to the original Furr’s Millionaire Pie recipe, but it is not the original. My Grandmother was the Pastry Chef for Furr’s and is responsible for introducing this recipe. Family legend reveals her to be the creator of Furr’s Millionaire Pie and subsequently, all of its knock-offs. She also purchased the Waldorf Astoria Red Cake from its source and introduced it to the Southwest. I’d tell you the difference between my Grandmother’s recipe and this one, but I’m still weighing the worth of going forward with crafting a book based on my inheritance of a small wooden “Gold Medal Flour Home Services Recipes” box. I would definitely consider making the recipes public. Books or even simply placing the content online for others is a great way to share memories from the past. This is my favorite of all pies! Our Furr’s closed about 6yrs ago! I tried this recipe doing the 2 pies as suggested. I found two pies to lack filling. So, I’ve tried the recipe using the filling in only 1 pie and it seems to work much better! The Furr’s here in Texas are starting close, what a shame. This looks like a great recipe. Anything like the taste of a Pineapple Upside Down cake? I live in Houston, and a Furrs just opened up a few months ago. You must live near Spring, I have been to the Furrs Buffet there recently. It was much nicer than the one that used to be located in the Greenspoint area. Do you happen to know the name of the pie that is like a sweet crispy eggwhites, nuts and ritz cracker?? I’m have tried for years to find the name.